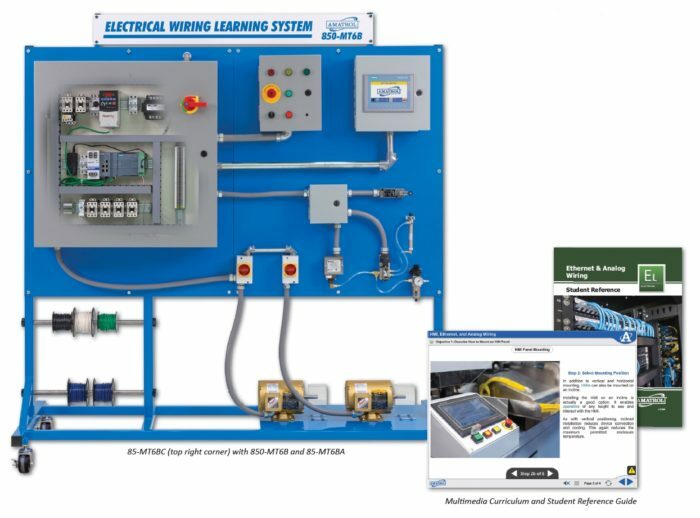 Amatrol’s Ethernet and Analog Wiring Learning System (85-MT6BC) covers topics and skills related to the installation, operation, and wiring of Human Machine Interface (HMI) panels, Ethernet switches, and analog inputs. This learning system will provide invaluable hands-on practice for careers like electricians and industrial maintenance technicians. This system requires the Electrical Wiring (850-MT6B) and VFD/PLC Wiring (85-MT6BA) systems. Ethernet and Analog Wiring includes a variety of real-world components such as a Siemens HMI panel, Ethernet switch, thermocouple, conduit set, and much more! Learners will study a variety of topics including how to interface and test an HMI Panel and PLC via Ethernet, how to install and test an Ethernet switch, and how to interface a transmitter to an analog input and test its operation and practice skills like interfacing a thermocouple to a transmitter. This system includes a variety of real-world industrial components like a Siemens HMI panel, Ethernet switch and cable, analog transmitter unit, thermocouple, cooling fan, and a conduit set. When used with the Electrical Wiring and VFD/PLC Wiring systems, learners will practice hands-on skills like wiring and testing an Ethernet switch and HMI panel ground and power circuits, interfacing a transmitter to an analog input, and constructing and testing a Cat 5 Ethernet cable. In-Depth Curriculum Covers How To Install and Wire Power to a 2-Wire DIN Rail Mounted Transmitter and Much More! Ethernet and Analog Wiring’s curriculum covers a variety of topics like HMI panel installation, wiring, interfacing, and testing, Ethernet wiring and switch installation, and analog wiring and interfacing. This system’s curriculum is presented in a stunning multimedia format that fully engages learners through interactive quizzes and exercises, voiceovers of all of the text, videos, and 3D animations. In addition to the Ethernet and Analog Wiring and VFD/PLC Wiring systems, Amatrol offers a third expansion system: Industrial Soldering (85-MT6BB). This system covers industrial soldering techniques commonly used within a control enclosure by industrial maintenance technicians. A sample copy of the Ethernet and Analog Wiring Reference Guide is also included with the system for your evaluation. Sourced from the system’s multimedia curriculum, the Student Reference Guide takes the entire series’ technical content contained in the learning objectives and combines them into one perfect-bound book. Student Reference Guides supplement this course by providing a condensed, inexpensive reference tool that learners will find invaluable once they finish their training making it the perfect course takeaway. Includes a variety of real-world components such as a Siemens HMI panel, Ethernet switch, thermocouple, conduit set, etc.